NASA-supported sleep researchers are learning new and surprising things about naps. June 3, 2005: Space travel is sleepless work. Despite NASA recommendations that astronauts sleep 8 hours a day, they usually don't. Strange sights and sounds, the stress of riding a powerful rocket, the lack of a normal day-night cycle--all these things tend to keep space travelers awake. Studies show that astronauts typically sleep 0.5 to 2.5 hours less than they do on Earth. 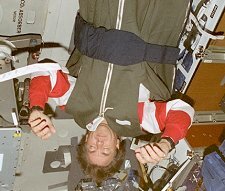 Although many astronauts report feeling fully rested after only six hours of sleep, the fact is, sleeplessness can cause irritability, forgetfulness and fatigue--none of which astronauts need to deal with while piloting complicated 'ships that hurtle through space at tens of thousands of miles per hour. The solution seems simple: Take a nap. But naps are a double-edged sword. Sometimes napping can leave you feeling even drowsier than before. If your body enters a deep sleep, trying to wake after only an hour or so can be very unpleasant, and you might remain groggy for some time afterward. This is called "sleep inertia." Why do naps sometimes backfire? Researchers don't yet know the physical causes of sleep inertia, but they would like to be able to predict, at least, when it's going to strike. This could help doctors prescribe naps of the right time and duration for drowsy people in high-risk professions. Helping astronauts nap was the goal of a recent series of experiments funded by NASA in cooperation with the National Space Biomedical Research Institute. In those experiments, led by David Dinges, a professor at the University of Pennsylvania School of Medicine, 91 volunteers spent 10 days living on one of 18 different sleep schedules, all in a laboratory setting. The sleep schedules combined various amounts of "anchor sleep," ranging from about 4 to 8 hours in length, with daily naps of 0 to 2.5 hours. To measure how effective the naps were, the scientists gave the volunteers a battery of tests probing memory, alertness, response time, and other cognitive skills throughout the experiment. They also measured things like core body temperature and hormone levels in blood and saliva, all of which fluctuate in a natural daily cycle known as a person's "biological clock." "To our amazement, working memory performance benefited from the naps, [but] vigilance and basic alertness did not benefit very much," says Dinges. 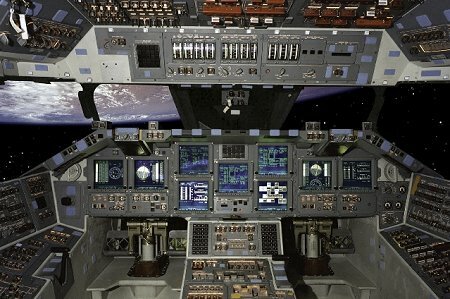 "Working memory," he explains, "involves focusing attention on one task while holding other tasks in memory ... and is a fundamental ability critical to performing complex work [like piloting a spaceship]. A poor working memory could result in errors." For vigilance and alertness, which involve the ability to maintain sustained attention and to notice important details, they found that the total amount of sleep during 24 hours remained the most important factor. Another interesting finding was that naps didn't work as well for volunteers on a nocturnal schedule. Sleep schedules for some of Dinges' subjects were flipped, so that anchor sleep occurred when their bodies thought it was daytime. The nap, then, fell in the middle of biological nighttime. This simulated what might happen when an astronaut's biological clock is out of sync with the mission schedule. These out-of-sync volunteers had a very hard time waking from naps, and the grogginess of sleep inertia lasted for up to an hour. Some sleep inertia did occur after naps on a normal schedule too, notes Dinges, but the inertia after a nighttime nap was much more severe. The ultimate goal, says Dinges, is to tie all these data together into a mathematical model of naps. Such a model, written as a computer program, could prescribe effective naps compatible with the scheduling demands of a mission. Not only astronauts would benefit from such a program, but also doctors, pilots, firefighters … the list goes on. Such a program is still in the future. Meanwhile, Dinges notes another finding of their study: Naps are a short-term fix, offering only temporary boosts in mental acuity. "They cannot replace adequate recovery sleep over many days," he says. In the end, there's no substitute for 8 sweet hours of shut-eye.